I’ve been to several Eurovision parties over the years. There is always a drinking game, a sweepstakes or even a combination of the two. This year, I decided to take a less passive approach. Apart from hosting a party, I decided to cook a dish that represented one of the countries I had drawn. Once I had drawn Italy, it could only really be meatballs and pasta, something quintessentially Italian and always a great crowd pleaser. Even though my fridge is covered with the flags of competing countries (and Australia), my heart and mind are firmly in Italy as I roll out the pasta in a continuous loop. Most people I know who make pasta use the formula of one egg to 100g of 00 flour. However, I have been using a recipe by Thomas Keller of French Laundry and Bouchon. I love it because it uses lots of egg yolks for a great colour and richness, it is easy to work with and gives great results every time, whether I am making linguine, tagliatelle or ravioli. 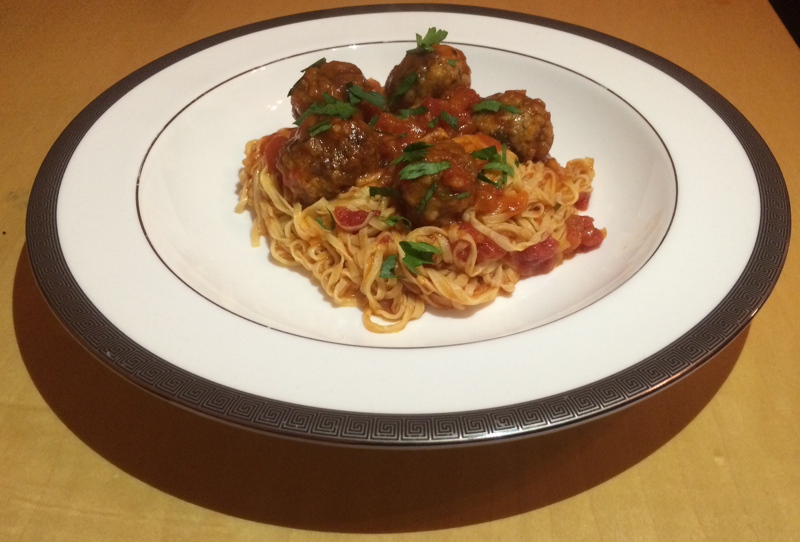 How I make meatballs has changed over the years. I used to be all about the beef and didn’t really want anything else detracting from the flavour. I thought an egg bound the beef and a little seasoning together well. What a difference time and changing taste buds makes. Now, I’m willing to give up on a little beefy taste in exchange for a little mouthful of heaven that melts in the mouth every time. A 50/50 mix of pork and beef mince is, to me, a great combination but it too needs a little help. The egg? Gone! It did what I wanted it to do, that is bind everything together so the meatballs did not fall apart in the pan. But it did it a little too well, resulting in meatballs that were too tough. Breadcrumbs, soaked in milk and gently squeezed of excess liquid before adding to the meat do the job just fine. They are the perfect wingman for my meat – they help you get the result you want without ever needing to make their presence felt or hog the limelight. While all this is going on, my tomato sauce is very gently cooking, the surface broken only by the occasional bubble. I have an Italian friend who lives near Bologna which is known as la grassa (the fat one) because of the high standard of food and the sheer number of word-famous produce from the region, such as Parma ham, Parmesan cheese, balsamic vinegar to name a few. She is adamant that a good tomato sauce or ragu needs at least a couple of hours so that any trace of rawness is cooked out. 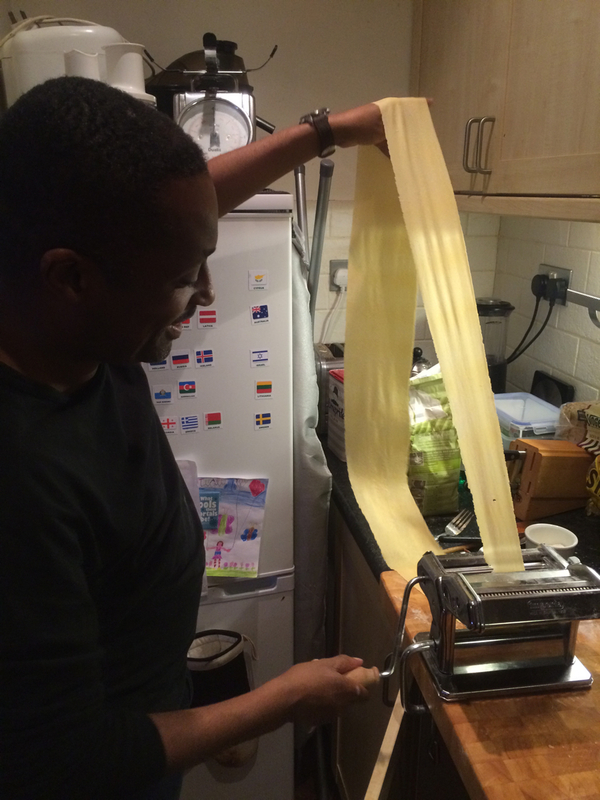 The dish may take a couple of hours on and off, but anything involving fresh pasta becomes a labour of love. And, let’s face it – after a couple of hours, you haven’t really missed that much of Eurovision, have you?